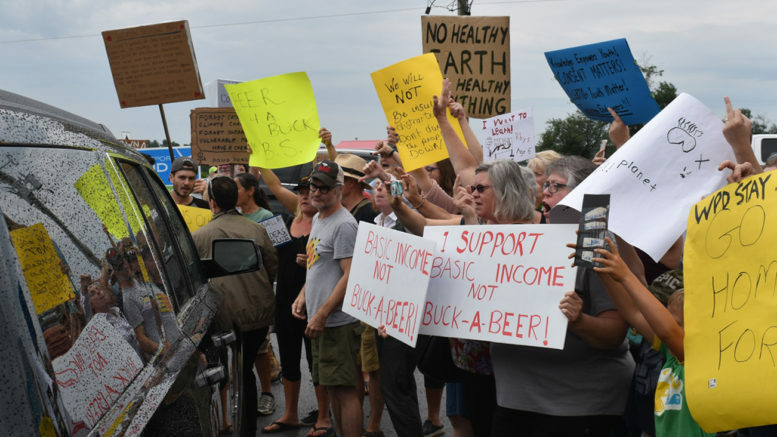 Premier Doug Ford’s contingent was met with protest placards as it rolled into Barley Days Brewery Tuesday morning as he prepared to announce the lowering of the floor for beer sales to $1 per can. Across the road from the brewery, about 15 people showed their lament for the cancellation of the White Pines Wind Project, while on the roadside just in front of the craft brewery, another 20 voiced their displeasure for the government’s direction thus far on social services, sexual education, and the environment. The numbers grew larger later that morning. Inside the Loyalist Parkway facility in a production room packed tightly with media and supporters, Ford, Finance Minister Vic Fedeli, and Government and Consumer Services Minister Todd Smith didn’t let the demonstrations damper their announcement. They gleefully stacked cans of beer and heralded the return of “buck-a-beer” pricing. Ford said the “day you’ve been waiting for is finally here” while announcing that the law will change Aug. 27, in time for the Labour Day long weekend. He explained it would lower the minimum price from $1.25 and took a swipe at the previous Liberal government while making the announcement. Ford stressed no brewers are being forced to lower prices and there will be no subsidies or handouts to encourage them to enter the market with $1 product. Instead, the government is challenging the province’s 260 breweries to bring prices down by Aug. 27. Those that do will vie rewarded with non-monetary rewards, such as prime shelf space in LCBO stores and features in LCBO magazines or newspaper inserts. “And the appreciation they get from consumers will be priceless,” the premier stated. he’s hoping others will follow. The premier faced questions about the potential harm of reduced beer pricing and the possibility of increased policing and health care costs. He said he trusts Ontario beer drinkers to be make responsible choices. 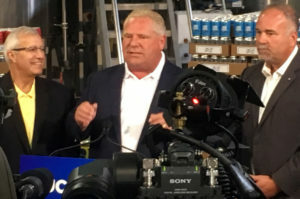 Ford was also asked about the government’s decision to end a three-year pilot project providing a basic income, a decision some critics have stated affects a similar demographic that the buck-a-beer promise was designed to appeal to. He stuck to his guns again. “If you went right across the province, that would cost $17 billion. That’s not realistic. As much as I want to help everyone — and we’re doing that by reducing hydro rates, creating great paying jobs, reducing costly taxes and putting money back into the taxpayers pockets — we can’t afford $17 billion. It’s unrealistic,” he said, before asking reporters if they had any questions about beer. Questions followed about incentives and the tax impact of the decision. Fedeli said the tax portion of beer is not being reduced and indicated the legislation does ask brewers to lower their margins. Outside, demonstrators were critical about the government’s priorities and messaging. Renaud said she was also disappointed in Barley Days for taking part in a stunt many other craft breweries have denounced. Asked about the chance to engage with the premier, she said she wasn’t really interested. Paul Snepsts, who started organizing the demonstration via social media, also didn’t think much of the announcement. Snepsts also said he doesn’t see a change in course coming from the government. The county resident also said he hoped the demonstrations would serve as a first reminder to Smith that as a member of government, he represents all the people, not just his own political party. Demonstrators remained at the entrance of Barley Days as the politicians left. Some chanted words like “shame” and “coward” in Smith’s direction as he entered his car for Queen’s Park, while some of Smith’s supporters chanted his name and applauded him as he left.